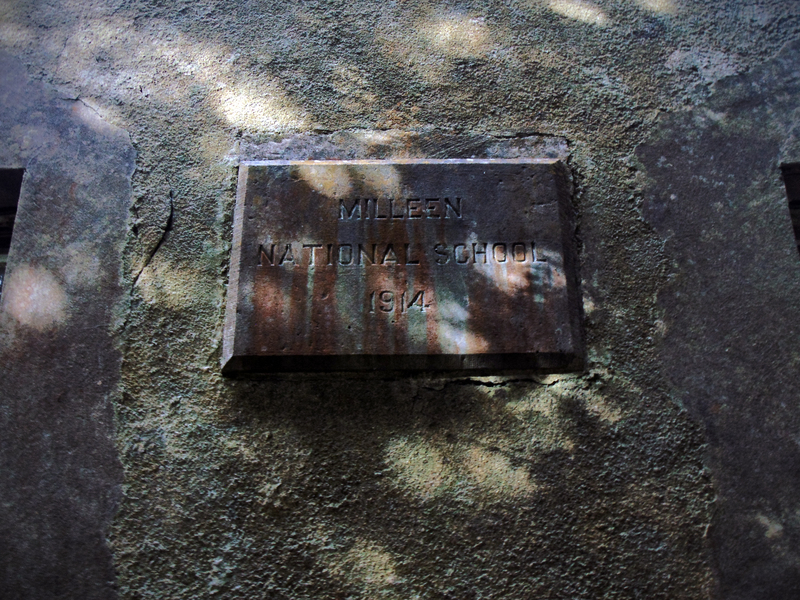 Old Milleen National School was built in 1914 and is identical in from to Scoil Bride Culaid, Cooly townland, Co. Donegal – a simple, detached, three-bay, single-storey national school on a T-plan with a gabled projection to the front elevation and two entrances (one for boys and one for girls?) to the sides of the projection. Like other school houses of this date, the schoolyard is also segregated for boys and girls. 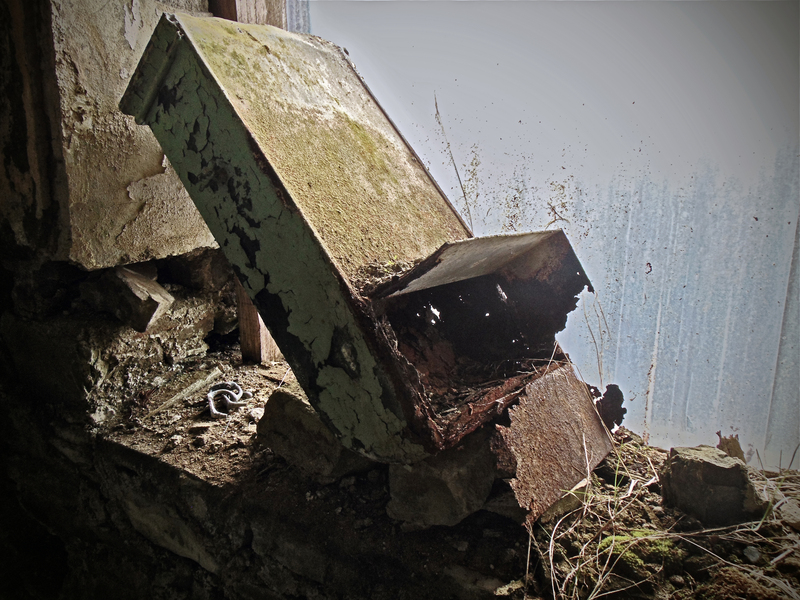 Unlike Scoil Bride Culaid, Old Meelin National School is in a poor state of repair both inside and out. Inside, the wainscoting has peeled from the walls and the fixtures and fittings are strewn across the interior. Like Scoil Bride Culaid, Milleen is a one-roomed building, separated into two classrooms by a sliding screen. The screen remains in place and is probably the best preserved feature of the school building. 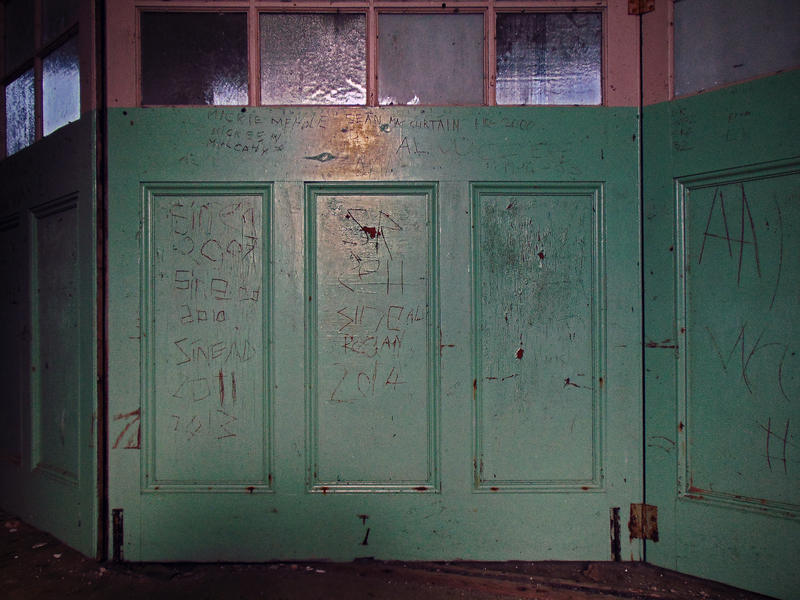 The exploits of local teens are delicately graffiti-ed on the wooden panelling of the screen. There are open fireplaces at each gable with the chimney projecting externally rather than there being a chimney breast inside the classroom. To each side of the fireplaces are tall, six-over-nine sliding sash windows. 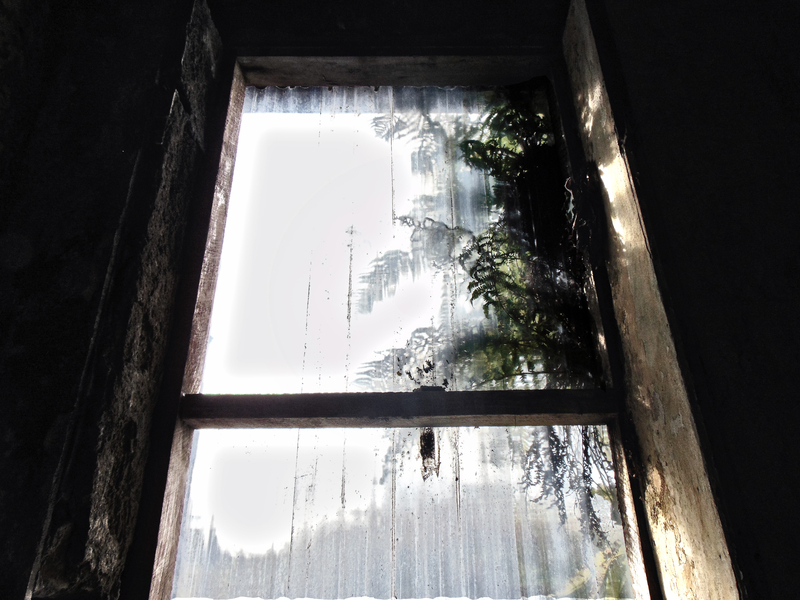 Those in the western gable retain some of their glazing, while at the eastern gable, the window frames have been robbed-out, though perspex keeps the encroaching greenery outside. The building is largely a rubble and mortar construction. 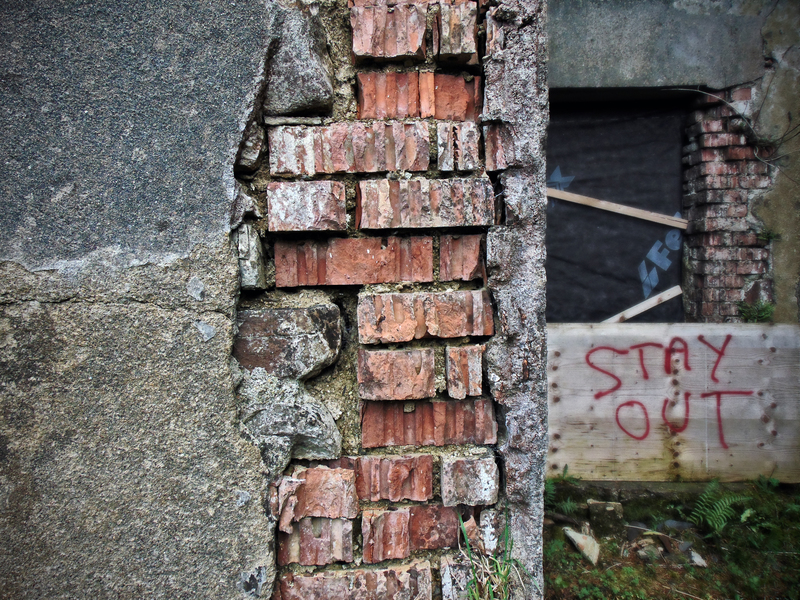 However, at the external corners, the render has fallen away to reveal the brickwork quoins. 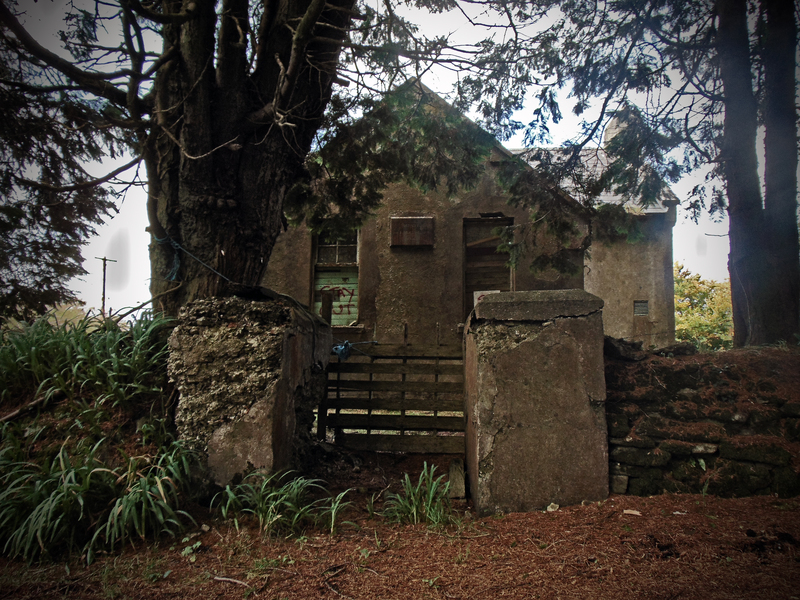 The old school house at Milleen reminds me very much of the examples at Réidh Reamhar (Reyrawer) and Sonnagh Old: set in forestry on a landscape that was once farmed but is now sparely populated and dominated by commercial forestry. These forests hide a depopulated vernacular farming landscape that is not more than 50 years out of use. 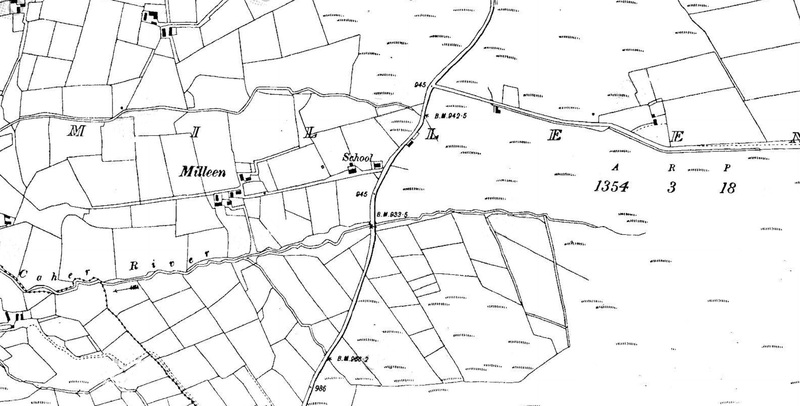 It was the rural population of this landscape that required and facilitated Old Milleen National School until it went out of use in the 1960s. If you or someone you know attended these national schools, please do get in touch and share any stories, anecdotes, photographs, or any other memories you may have. 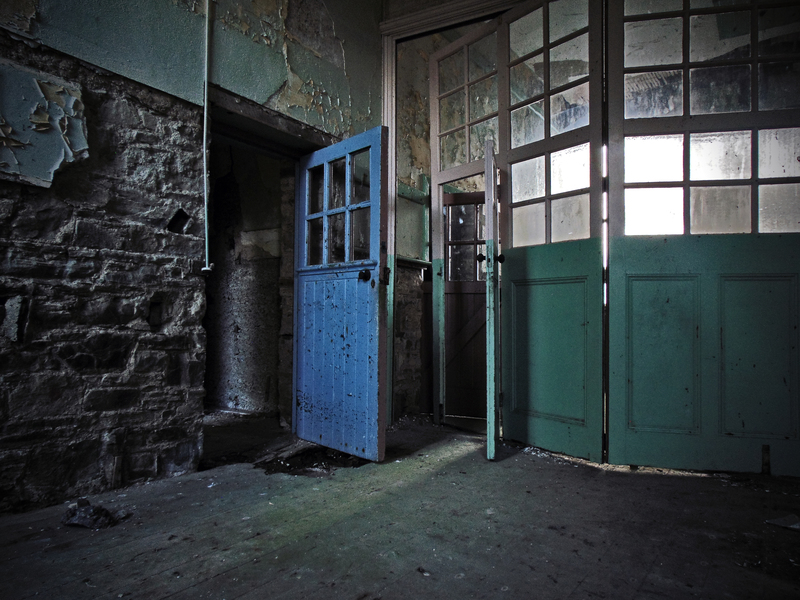 If you would like to purchase the book The Deserted School Houses of Ireland, visit the shop page here. Still with its stout gate posts and screen. I was having a mooch in Kilthomane today, a sad state of affairs now. I haven’t been out that way this year. I’d imagine that the building hasn’t improved anyway. And poor old Dunbeacon has almost gone. I’d like to see Dunbeacon again. It was getting dark when I was there and the photos were a little poor. I’ll have to hurry before it collapses.